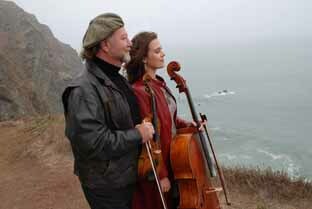 Don’t miss the opportunity to hear the return of Alasdair Fraser, Scottish fiddler extraordinaire and Natalie Haas on cello! Alasdair, now living in the Sierra Nevada foothills, has long been a favorite in his adopted country. He performs solo, as well as with groups as diverse as the Los Angeles Master Chorale, The Waterboys and The Chieftains, and as a featured soloist along with Itzhak Perlman at New York’s Lincoln Center. Acclaimed by the San Francisco Examiner as “the Michael Jordan of Scottish fiddling,” Alasdair has a concert and recording spanning over 35 years, with a long list of awards, accolades, television credits, and features in top movie soundtracks (including Last of the Mohicans and Titanic. Natalie started out as a student of Alasdair’s at age 11, and they began performing together when she was 15. She adds a “percussive power to Alasdair’s fiddle fireworks, providing syncopated, bowed underpinnings to his melodies and solos,” according to Kira Schlecter, of The Patriot News. They have They have released two fine recordings since their first appearance at Caltech, Abundance and Highlander Farewell. Listen to The Sailor’s Wife/The Lads of Duns from an earlier recording, Fire and Grace. Their web sites are Alasdair Fraser and Natalie Haas It has been over 7 years since their first show, so don’t miss this overdue opportunity! The show will be in Beckman Institute Auditorium (Little Beckman) and tickets are $20 for adults and $5 for Caltech students and children. Tickets can be purchased on the phone (626-395-4652) with a credit card (a service charge will be added per order), purchased at the Caltech Public Events Ticket Office at the Winnett Student Center for face value (Generally open Monday-Friday 9AM-4PM) or purchased at the door for cash or check (no credit cards.) Better yet, join our mailing list and you’ll be informed about such situations ahead of time.